1. Preheat the oven to 200°C, gas mark 6. Whisk together the sugar and egg until thick and fluffy. Sift over the flour and baking powder, and gently fold in with the vanilla, freeze-dried strawberries and melted butter. 2. Line a baking sheet with baking parchment. Use a teaspoon to spoon 8 rounds of the mixture onto the sheet, making sure they’re spaced well apart. Bake for 6-8 minutes until set and golden. Leave to cool. 3. 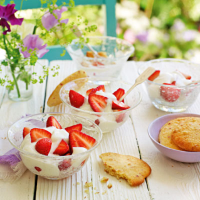 Spoon the strawberries into serving bowls and top with the fromage frais. Serve with the sponge drops.